This restaurant is part of the family run Hotel Revolver, a budget lodge which is themed on Beatles. Like the hotel, the restaurant is also unique and not much touted or publicized. If you care to take an authentic Naga or Nepali cuisine, then this is one of the best restaurants in Darjeeling. 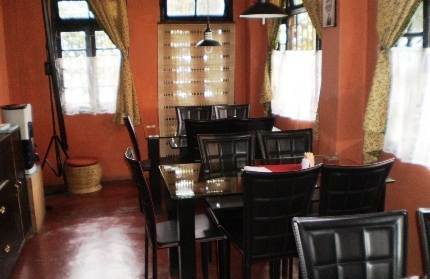 The restaurant is located on the ground floor of the small two storied hotel and is open to both the hotel guests as well as others. From the prominent Clock Tower landmark, the restaurant is 10 minutes walk along Gandhi road. You will see a small red colored board on the right and next to the Union Church. Walk through the Church premises along a narrow passage, and at the end you will find the moss green colored building with a gate in front. It hardly looks like any commercial establishment. After all it's run by the couple Asenla and Vikash who have converted the one storied family house to a hotel and a restaurant recently. But they have done it with lot of passion and delicate touch. 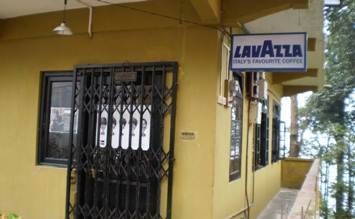 As you enter the gate, right in front is a big sign board showing "Lavazza" Italian coffee. And there is a door having a poster showing the four cartoon figures of the Beatles group. That's the restaurant. Just walk in and you feel like you are at home. The interior is in light red pastel color. 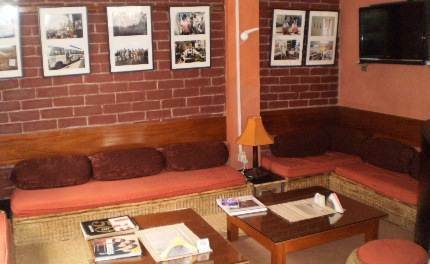 On the left is a small cozy lounge area having low cushioned seating arrangements on cane sofas. There are lots of magazines on the glass center table and small framed pictures on the brick textured wall. A light soft music plays most of the time that sets up a wonderful atmosphere. In the lounge there is a large LCD TV. In fact you can pick up a DVD and watch a Beatles concert or even play one of the interesting games. As you enter the door, straight ahead is the small dining space or the main restaurant area. There are only three tables laid out here with lamps hanging from the ceiling. The black leatherette chairs with metal legs and the glass top tables fit perfectly into the friendly ambience. The restaurant is spotlessly clean and well maintained. Kitchen is adjacent with a common wall. Once prepared, there is a small opening through which the food is passed on from the kitchen to the waiter at the dining space. There are two local boys who serve as waiters for the restaurant as well as the hotel. Asenla herself is usually there to take care of the guests. While the menu is not elaborate, there are unique dishes served by Revolver. They are really prepared with care and served piping hot. I have stayed in the hotel and taken all the meals at the restaurant. They have been consistently great. The restaurant serves breakfast, lunch and dinner. For lunch and dinner, you will need to order in advance so that they keep the ingredients ready. They usually do not stock up much food unless there is a demand. There is a set breakfast that offers toasts, fried eggs, bacon, sausages, butter and jam. You can of course get the eggs prepared to your choice or choose your items separately. Other items include mashed potatoes, baked beans, pancakes with honey, corn flakes with milk, muesli with milk, cheese & egg sandwiches etc. Hot lemon with honey, Darjeeling tea (black, with milk, with lemon), cold drinks, fruit juices. And Vikash Pradhan (the owner) takes big pride in the fact that they are the only place in Darjeeling who offer hand made fresh coffee (from roasted beans). While CCD at the Mall too offer fresh coffee, but that is machine made. Variations include thick tomato, mixed vegetable, chicken delite, chicken sweet corn, creamy mushroom etc. Knorr soup powders are used without any extra preservatives. Naga platter with rice, dal, boiled vegetables and pickles. You can complement it by fermented bamboo shoot with pork/chicken/fish, or dried bamboo shoot with pork, pan fried smoked pork, or smoked pork with fermented soybeans. The Naga platter is a great healthy food as no oil is used in the preparations. Note that fermented bamboo shoots have flavors. So if you are not used to it, go for the dried bamboo shoot based dishes. Extra helpings are offered with the basic platter. Another great option is Yahako, a local cuisine and a platter with rice, dal, vegetable curry and pickles. You can complement this basic local platter with chicken or pork curry. Extra helpings are provided with the basic platter. They also offer special dishes like Khutta ko Achar (pork trotters) and Pachauney (a beef preparation). But you will need to order these one day in advance. So in nutshell, what kind of food can you expect in Revolver restaurant? As they themselves define it "Our fare is simple, tasty and hygienic, and easy on your pocket". The breakfast is served between 7:30am and 10:30am. They don't serve lunch these days. Dinner timing is from 7pm up to 8:30pm. For dinner, order in advance (for example tell them the number of heads and choice of food by lunch time). For special dishes, they need at least 1 day advance order. Revolver restaurant is located on Gandhi road and 10 minutes walking distance from the Clock Tower or Clubside Taxi Stand (across Gandhi Road Police Point). You will need to enter through the Union Church premises on the right and along a narrow alleyway.